The construction industry is one of the most resource-intensive sectors of the German economy. The nation’s buildings constitute a vast store of raw materials, harboring some 100 billion metric tons of materials that could be recovered and returned to the material cycle at the end of their service life. Four Fraunhofer Institutes have joined forces in the BauCycle project to kick-start recycling of sand and gravel fine particle fractions that cannot be reclaimed today for reuse in further construction projects. The research team will present the results of their work at the 2019 BAU trade fair in Munich from January 14 to 19. The showcase at booth 528 in hall C2 will feature aerated concrete blocks made of recycled rubble, acoustical building materials, and components made of mineral granulates. After a day at the beach, sand would hardly seem to be in short supply. Appearances deceive, for this valuable commodity is growing scarce in many countries, one reason being the global construction boom. It takes mountains of concrete, which consists mostly of sand and gravel, to build hotels, shopping centers and industrial parks. Dubai, for example, had to import Australian sand to erect the Burj Khalifa skyscraper; its own desert sand was ill-suited to this purpose. Even Germany’s deposits of gravel and sand are dwindling, as a recent report by the Federal Institute for Geosciences and Natural Resources noted. Worldwide, some 40 billion metric tons of sand and gravel are used up every year. During the same time span in Germany, demolished buildings and infrastructure leave behind around five million metric tons of fine-grained building rubble. To date, it has ended up in landfills or was used in road construction; upcycling was unheard of. This prompted the Fraunhofer Institutes for Building Physics IBP, for Material Flow and Logistics IML, for Environmental, Safety and Energy Technology UMSICHT, and for Optronics, Systems Technology and Image Analysis IOSB (see box) to launch a project called BauCycle to recycle construction waste. Their aim is to transform this mix of minerals into a sustainable resource and demonstrate potential applications in construction. One specific target is to recycle particles of mineral construction waste measuring less than two millimeters in diameter. To do so, the researchers are developing innovative sorting processes and high-quality building materials. And to cover the entire value chain, they also plan to set up a dynamic market platform where raw materials are traded as commodities. “Building sand is not superabundant; in Europe, for example, sand is in short supply in Sweden and France. The conventional method of treating rubble is to crush it. Components of less than two millimeters are sieved out and end up in landfill. If this fine-grained building rubble – which consists mainly of sand-lime bricks, bricks, concrete and small amounts of gypsum – were to be recycled, this could redress the sand shortage over the long term,” says Fraunhofer IBP scientist Dr. Volker Thome, the project’s manager. The first step is to sort the rubble’s heterogeneous content. Gypsum particles have to be selectively separated – they are decisive to the concrete fraction’s recyclability. The researchers developed an opto-pneumatic detector that enables fine fractions to be separated on the basis of the color, brightness and chemical composition of the particles; it is even capable of distinguishing sulfates from silicates. “The waste components are placed on a conveyor belt that transports them past an infrared camera equipped with special filters to detect the various fine fractions. The particles drop off the end of the belt in free fall, past nozzles that shoot the main components into different containers with targeted blasts of compressed air,” says Thome, describing this optical computing technique. Dr. Thome and his team have succeeded in differentiating one-millimeter particles. This technology can achieve a throughput of 1.5 metric tons per hour. In the best-case scenario, four clean aggregates may be recycled and reused to produce aerated concrete, a light building material with good thermal insulation properties. It is suitable for building two-story houses and as indoor insulation. Tests have shown that aggregates of concrete and sand-lime bricks are also recyclable and can serve as a secondary raw material for making competitive grades of aerated concrete. The scientists achieved the best results with a mix of 80 percent sand-lime bricks and 20 percent reclaimed concrete. 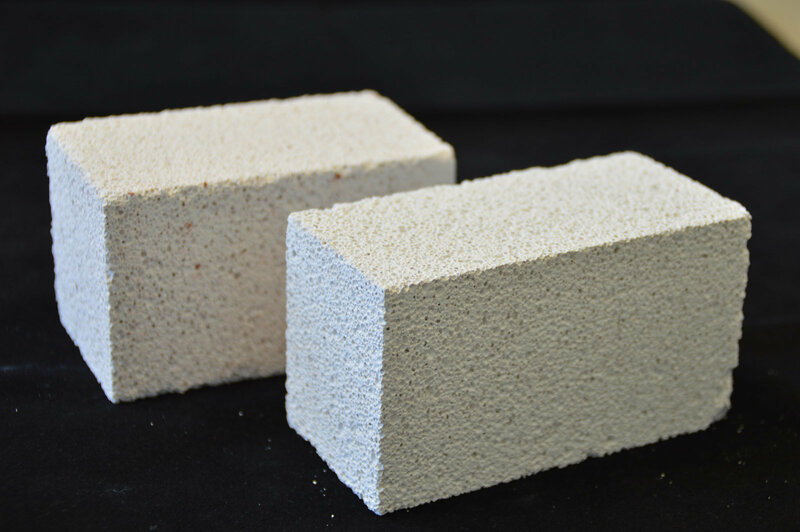 Another project finding was that a combination of bricks and recovered concrete can be used to make geopolymers, a cement-free building material that is strong and acid-resistant, much like concrete. Geopolymers have the added advantage of a very low carbon footprint. The researchers made various components to demonstrate the recycling potential of construction waste. These will feature prominently at the Fraunhofer booth (booth 538 in hall C2) at the BAU trade fair in Munich from January 14 to 19. A team of experts will show samples of different aerated concrete mixes, facade cladding made of geopolymers, and a prototype of a sound-absorbing, open-pored panel made of granulates. “In tests, our acoustical component made of secondary raw materials exhibited the same sound-absorbing properties as products available on the market,” says Thome. Plans are underway to establish a commodities exchange where raw material vendors and recycling companies can offer their products. Building material manufacturers will be able to buy source materials on this platform. “Recycled products have yet to be sold on established markets. There is a lack of confidence in and knowledge of these secondary raw materials. We want to close this gap with a commodities exchange,” says the project manager by way of explanation. This recycling concept for fine-grained construction materials is also applicable to other industries that work with similar fine fractions. Many mechanical processing plants such as glass-recycling and mining-industry facilities produce this type of waste.